I've never been a big fan of squash. I don't think my parents ever prepared it growing up, which isn't surprising, as they got - and continue to get - the majority of their vegetables from the canned foods aisle. So when Kroger had squash on sale a few weeks ago for a buck a piece, I grabbed five dollars worth - one butternut squash (which is still on my counter...), one spaghetti squash, and two acorns. Even though we had plans to go camping for Thanksgiving and you can't exactly stuff a squash at a campsite (or can you???) I still wanted to make this dish for the holiday. As a compromise, I had a "Fake Thanksgiving" dinner the week before "Real Thanksgiving," which featured sweet potato casserole, garlicky green beans, and stuffed acorn squash. There are a few warnings that come with this recipe. It's easy and tasty, but a little... bland? Yes, that's the word. Bland. Not unpleasant, and still tasty, but lacking the cornucopia of flavor explosion I had envisioned. Still, a perfectly nice centerpiece, especially when paired with very flavorful sides. Also, confession time: I don't make stuffing from scratch. Never have, and probably never will. The thought of preparing my own bread crumbs makes me want to run and hide. Instead, I purchase Pepperidge Farm Cubed Herb Stuffing Mix. Yes, it is full of additives and chemicals. Yes, there is a giant cooked bird on the front of the bag. Yes, it is technically "vegan," even if it is not whole, or fresh, or particularly good for you. Sometimes, corners must be cut. 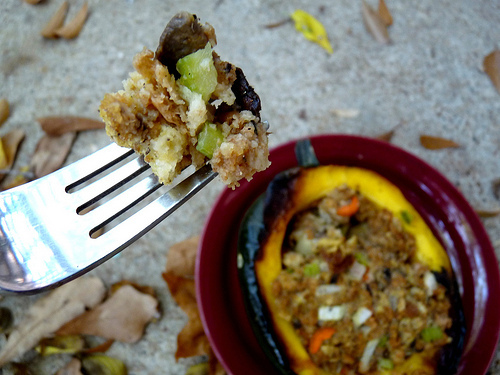 Even though I cheat with the stuffing mix, I love my stuffing to be chock full of veggies. Does that redeem me, even a little? I like to think so. 1. Preheat oven to 375F. Cut the acorn squash in half and scoop out the seeds and cuts. Rub the inside of the squash with a small amount of olive oil, and lay face-down in a shallow baking dish, filled with about two inches of water. 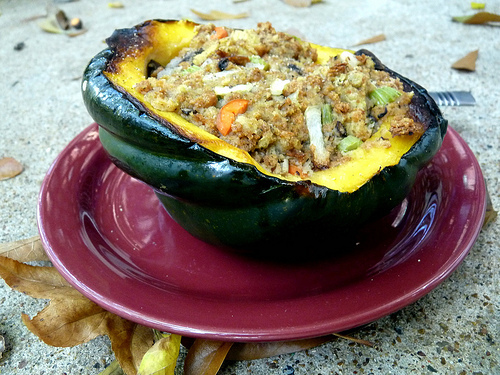 Bake for 45-60 minutes, or until you can pierce the squash with a fork. 3. While the broth is boiling, saute the carrots and celery for 2-3 minutes. Add the mushrooms and saute for another minute or two, until the veggies are soft but not mushy. Add the veggies to the stuffing and mix until well combined. 4. 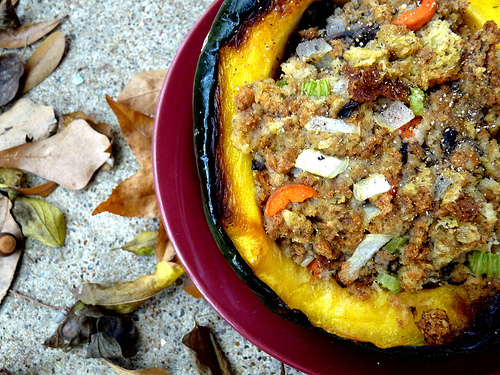 Remove your acorn squash from the oven, turn right side up, and fill with stuffing. Don't be afraid to really cram it in there! Return squash to oven and back for another 25 minutes. Enjoy!